Young Romance 2: The Early Simon & Kirby Romance Comics By: Joe Simon & Jack Kirby, edited by Michel Gagné. Release Date: March 2014. Photograph of yours truly by James L. Carey. 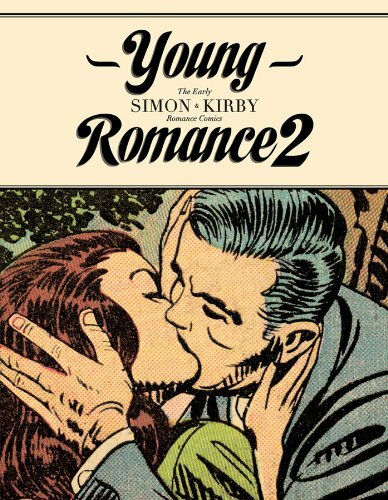 Fantagraphics was kind enough to send me an advance copy of their newest romance collection, Young Romance 2: The Early Simon & Kirby Romance Comics to share with you fine folks! I thoroughly enjoyed reading this archival collection that covers Simon and Kirby’s early romance work spanning from 1947 to 1949, and I think you will too. The stories in this volume are primarily from the inaugural romance title, Young Romance, but two stories are from sister title, Young Love. These pre-Code stories differ quite a bit in style and substance from the beloved 1960s and ‘70s comics I usually cover here at Sequential Crush, but they are undoubtedly a treat to read. Young Romance 2 begins with a short introduction by comics historian Bill Schelly and goes on to feature 17 stories in full color, a brief explanation of the restoration process, and short creator bios. In my opinion, the restoration work done for this volume is stellar. It managed to avoid the bright colors that sometimes get worked into modern day interpretations of older comics, yet the subdued colors look fresh and inviting. The pages themselves are a creamy white and reminiscent of what the pages may have looked like fresh off the newsstand. Readers will notice that many of the themes in these early stories recur in the 1960s and ‘70s romance stories. One such example is “His Best Friend’s Sweetheart” from Young Romance #3 (1948) (misprinted in the table of contents as “Her Best Friend’s Sweetheart”) in which a young lady waits for her sweetheart to come home from war, only to have his best friend try to scoop her up in the meantime. I think you, my dear readers, will delight in exploring the types of stories in this volume which give a foundation for the material I present here at Sequential Crush. Other memorable stories in the volume include “I Fell in Love with My Star Pupil!” from Young Romance #5 (1948) (also misprinted in the table of contents as “I Fell in Love with My Pupil”) in which a big city teacher moves to the country, only to fall in love with a non-traditional adult student. Though the townspeople disapprove and run her out of the community, love proves stronger than hate, and the couple ends up marrying. “War Bride,” originally published in Young Romance #7 (1948) chronicles the heartbreaking story of a young French woman who comes to the States after falling in love with a dashing GI, only to have her betrothed die in a freak accident immediately upon her arrival. “War Bride” stands out from the pack for its message at the end which instructs readers to choose love, not fear. My other personal favorite was probably “Too Wise for Romance!” from Young Love #2 (1949) in which a young woman with dreams of Broadway hits a rough patch and turns to taxi dancing. After an old flame comes back into her life, his support enables her to get back on track to pursue her dreams. One definitely has to remember that these are pre-Code stories, and because of that fact are filled with language that wouldn’t be seen in the later romance comics -- “Hussy” and “Sadistic fool” among them. When the main male character in “The Man I Loved Was a Woman-Hater!” from Young Love #1 (1949) lets it be known about his rough and tumble self, “Pete Lewis can be a cutie too!” I just about lost it. This is the type of dialogue you just want to wrap up and hug tight. You’ll also probably notice while reading these stories that overall, each panel is much busier than the panels in later romance comics. Romance comics (and comics in general) were just plain wordy back then. So prepare yourself for lots of reading with these. Throughout the volume, the art is also incredibly detailed and strangely enough, it was the mundane things that thrilled me… a cast-iron pan here, a wood-burning stove there. For me, the backgrounds are an education in our material past. Another observation that will stick out for fans of later romance comics is that in these early stories, young women live almost exclusively with their parents prior to marriage. No roommates or independent living arrangements for these leading ladies. This volume really gives the reader a clear look at what romance comic book stories were like during the early days, but unfortunately, not what romance comics issues in their entireties were like. For one, I would have liked to see a gallery of covers, such as the gallery of photo covers that was included in volume one. Also what was missing were examples of the advice columns, fashion pages, and other featurettes. Those aspects of the romance comics that make them so different from other genres are certainly missed in this volume. Even a representative advertisement or two would have been a welcome break from the text heavy stories. I would have also liked to see either a longer introductory essay or breaks in-between the stories giving more historical context. A bit of a nitpicky thing, but I was disappointed by the number of mistakes in story titles in the table of contents as it could cause confusion for the reader. However, the high quality restoration of the pages overshadow those minute oversights. What you’ll discover after reading this volume is that the early Simon and Kirby romance stories are filled with young women who are steadfast in their dreams, and won’t quit until they reach them -- whether their dreams be fame, wifehood, or a new lease on life. While it is true that the romance comic book stories of the 1960s and ‘70s will always occupy the majority of my affections, these early romance stories still have a special place in my heart. Order your copy here,* and be sure to let me know what you think of it! *Full Disclosure: If you decide to purchase through my Amazon link, I get an itty bitty commission. This will not cost you anything additional, as Amazon has built in an extra cost to each item to accommodate for purchases made through affiliate links. As always, I appreciate your support!